Oregon was another near miss. Having spent all of April and half of May enjoying the rich variety of California, with her deserts and beaches, city culture and mountains, we ended our time in the Golden State with a stay in a National Forest campsite near Lake Shasta. It was great for exploring Lassen Volcanic National Park, which we hadn’t even heard of before then and is definitely worth a visit, and where we met a couple who told us how much they love Oregon. Our campground was very buggy though, so after I’d been bitten on the face twice while we were packing up to leave, John was probably not relishing the idea of any more forested sites. 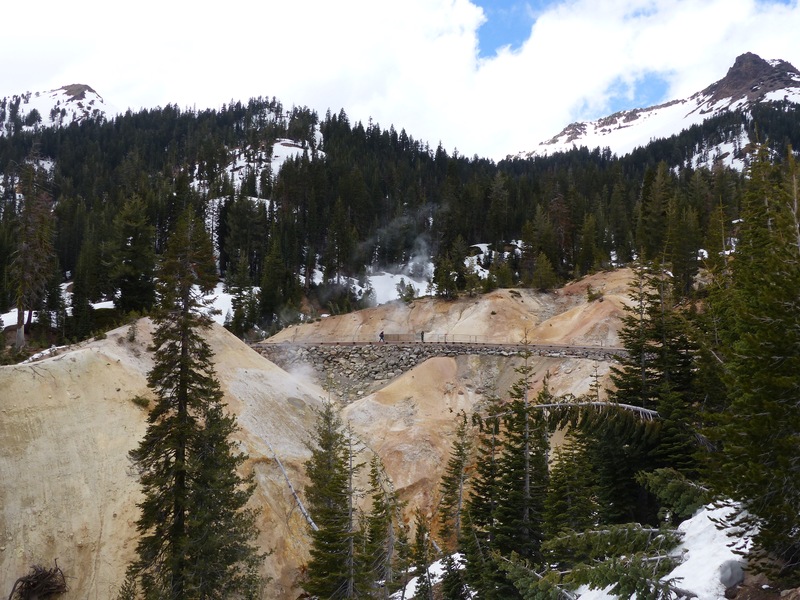 John hiking through the sulphur works at Lassen Volcanic NP – boiling, steamy and smelly! 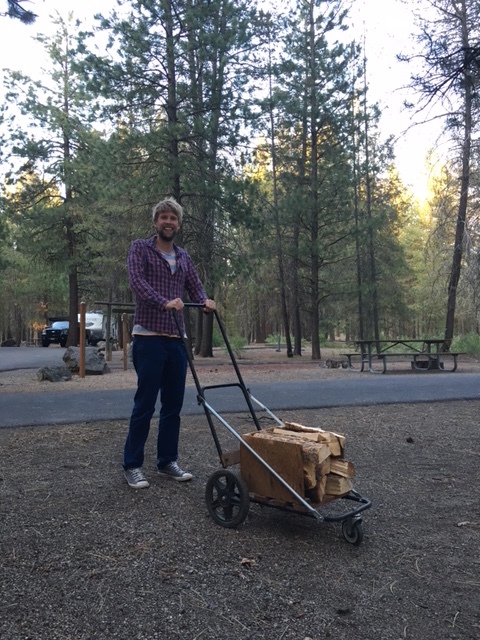 “Oregon’s just all forest, all like this”, he said, knowledgeably, harking back to his 7 week roadtrip in 2008. I knew John was keen to make tracks to Idaho as, inexplicably, he seems to have big dreams about what I know only as home of potatoes. 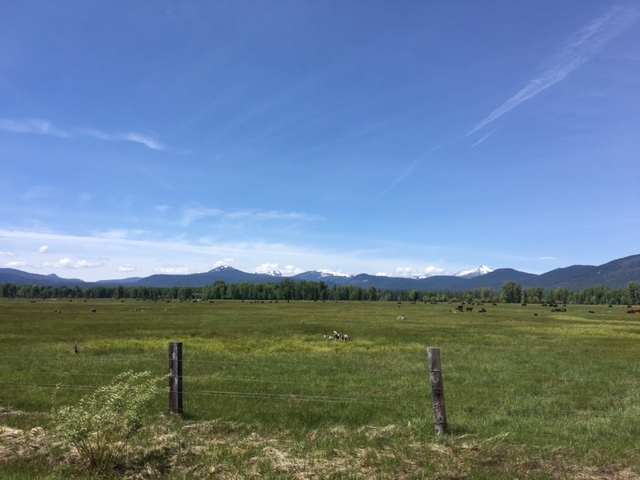 Fortunately, I’d mentioned on Facebook that we were headed to the Oregon border, prompting a flood of comments about how wonderful it is and lots of ideas for sights. 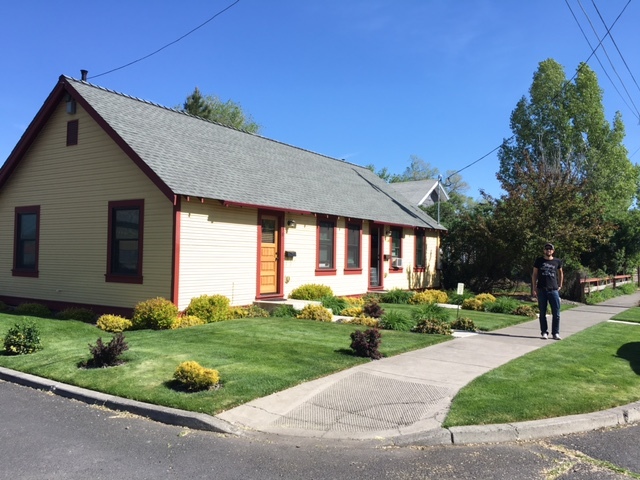 John was still unsure, and I could tell was concerned about timescales – three weeks exactly to cover the thousand or so miles from where we were to where we needed to be in Utah on 5th June, and a lot of mountains in between. Enter stage right another of our travel angels, Russ, brother of Deb, and another well-versed RV-er, for whom Oregon is familiar stomping ground. Within minutes, he’d plotted a rough route for us, taking in many of the recommendations he and other friends had and bringing us out in Utah a few days early. John had a bit of a pow-wow with Steve about some towing concerns and thus, fully briefed, we made tracks for the border, with happy hearts. Thank goodness for friends because no sooner were we over the border, than we realised what an epic mistake missing this beautiful state would have been. Entering south and heading up the central/eastern side gave us mountains and valleys of such lush greenness we felt we had finally found somewhere to rival the beauty of our homeland in May. We loved the tropics of Florida, the deserts of the south west, and the golden rolling hills of California, but few things lift the heart more than England’s green patchwork in bloom and I had been feeling a touch homesick after our 6 weeks of family and friends. Oregon, it seems, would soothe that ache. Oregon from the road. Green and mountains. Forever! 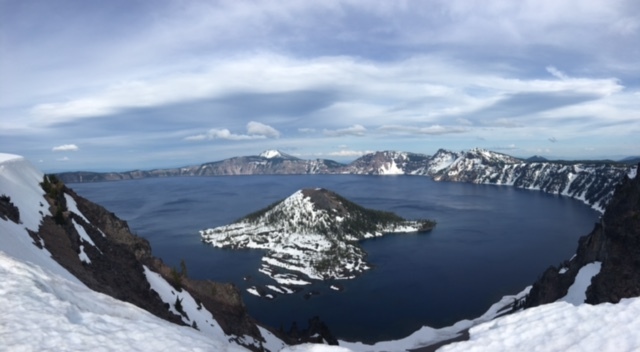 We picked our first campground near to Crater Lake National Park, the other end of the awesome Volcanic Legacy Byway, which brought us up from Lassen Volcanic NP via more cinder cones, and into Oregon. One of the reasons this year has been a dream for us is that we’ve both always yearned to travel these routes, towing along at our gentle pace, gawping at the beauty of the country. Crater Lake is the other end of this trail, and rather than the soaring volcanic peaks of Lassen, the park showcases an immaculate blue lake, formed when a volcano first erupted and then collapsed. The wonderfully 30s visitor centre rather over eggs the blueness of said lake, so that John and I couldn’t help but be slightly underwhelmed when at last we gazed on its, admittedly very blue, surface. However, given that the park is covered in over 40 foot of snow every year, and is therefore still partially closed, we had a surprisingly enjoyable time hiking up the closed mountain road, stopping to admire the lake, and taking lots of photos of the snow. Our first Oregon State Park campground was excellent. We had water, electric and sewer connection, a laundry and a large flat site, fire ring and picnic bench for $26 a night – back to Florida standards! There were some lovely hikes out along the river, which was again stunningly lush and green (you’ll notice a pattern here) and which brought us out at the not to be missed ‘Logging Museum’! We actually did enjoy this outdoor museum, which tells the tale of the logging industry from the mid 1800s to present day, via a lot of large pieces of logging equipment, and some vintage trucks I know John was keen to trade for the Yukon. One of our hikes took us past the back of the campground, and to my surprise I recognised an RV as belonging to one of my fellow Insta travellers. After a slightly stalky introduction (“Hi, are you Peter, I recognise your rig from Instagram….”! ), we got talking to Peter and his dog Rudy (subject of many comedy posts) about our shared love of the open road. I am pleased to report that the first real life person we’ve met from my Instagram adventures was very friendly, interesting, and reiterated that we shouldn’t miss the beer in Bend. I won’t go into the details of Bend’s beer, as I fear I will duplicate the Guest Ale Column, which John is no doubt mentally penning, but suffice to say that Bend is definitely worth a stop. It’s friendly, it’s very green (some of the most immaculate front lawns I’ve ever seen), and the views of snow capped mountains while sipping a cold pint of Pilsner even had me raving about the beer scene. Downtown Bend – steps from a brewery. From Bend it was time to head for the coast, which we had heard could rival Big Sur for rugged beauty. I was not sure how much more beauty there could be, inland Oregon has it in spades, but I am never one to turn down a walk on the beach and with an impressive selection of State Park campgrounds right up and down the coast, we were pretty excited to be heading west to take our pick. What Oregon has shown me so far is that it pays to listen to your friends and to be flexible in your plans. I’ll be sure to remind John of that when he’s driving through the night across Idaho, dodging potatoes and keeping Utah in his sights. Oh Linda, tell me that Idaho is ugly and we won’t want to stay! Glad you got the chance to experience the Oregon Coast. It would have been a shame to pass this chance up. Happy travels to Idaho also.